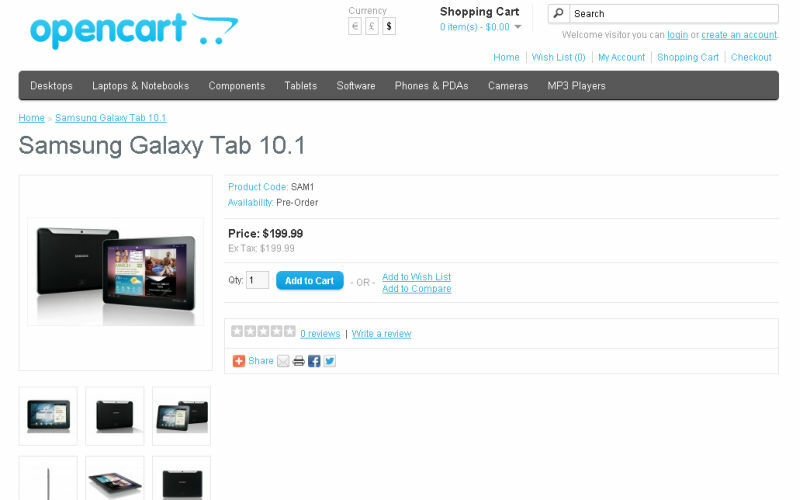 OpenCart is quite a popular script for managing your online shopping cart. Large number of plugins, good efficiency and easy customization make it an interesting alternative for PrestaShop. Free version of the script is not as rich when it comes to functionalities as PrestaShop or Magento, but it's, at least in part, balanced by about 1600 free and 4000 paid plugins. Unfortunately it's not so great when looking at it more closely. These numbers include plugins for all versions. If you're looking just at the latest version, you get "only" 1500 plugins. Still it doesn't mean you will have your pick. Many programmers creating the plugins compete against eachother. It means the number of unique functionalities is much smaller than the number of plugins. On the other hand it also means, that when you need to buy/download an advanced client reports plugin, there's about a dozen to choose from. Technical support you can get from discussion boards and a number of users contributing to it is not as impressive as in case of PrestaShop. Nevertheless the community of OpenCart is substantial. First of all, the script architecture is based on a popular program model called MVC (Model-View-Controller). 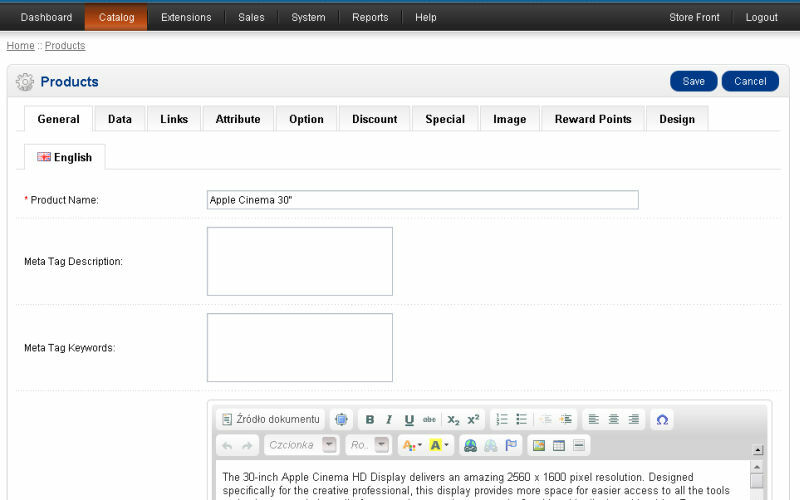 Secondly the script, just as Quick.Cart and Magento, is XHTML compliant. MVC model used in the script makes it quite easy to "get around" the code and modify it by programmers. Especially by those programmers, who've worked with MVC before. The script, unlike PrestaShop, is not based on a "Smart" style template system, but there's a clear structure of graphics templates. That's why there should be no problem setting up the shop's look. In OpenCart there are not as many built-in functionalities as in PrestaShop or Magento. But that's what makes it much less demanding when it comes to server's RAM. Of course adding too many plugis could eventually lead to a drop in speed and efficiency. 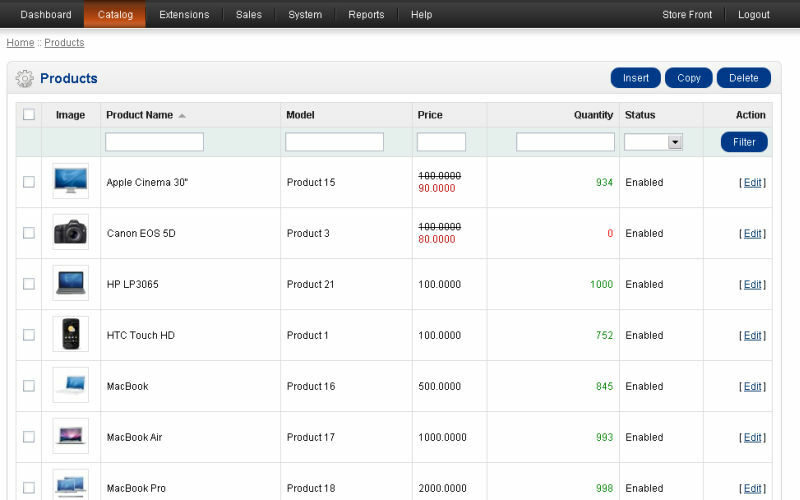 Neat, clear and easy to manage administration panel is one of the biggest advantages of OpenCart. It may not be as advanced as PrestaShop or Magento, but it's a better choice for the first-timers. It often happens, that when buying some plugins for your OpenCart and then updating the script to a newer version, some of the functionalities will not work or show errors. Many plugin authors releases updates, but sometimes it could take a while. The script being one of those not short on functionalities, lacks some options like reporting related ones. So if you're looking to have a large shop, you should first check if OpenCart offers the functionalities you will need. If it doesn't, try to look for them on a free and paid addons list. It's often the case that what Magento and PrestaShop offer for free, you need to pay for in OpenCart. OpenCart is an interesting alternative for PrestaShop. It's a very good script for beginners and intermediate programmers/shop owners. It works fine with almost any number of products. It requires more server resources then Quick.Cart but much less than PrestaShop or especially Magento. Matching the number of OpenCart functionalites to PrestaShop's could mean getting a poorer efficiency. Good tech support and a large number of free addons make for good cart's development opportunities, as well as a good start for you business. For those who want the customization and control of a self hosted I recommend Opencart it has very clean interface, light design,flexible and have a lot of advance features that you can use and configure. If anyone says OpenCart is a good product, then s/he either has a one-product store, or has just seen internet. I am a professional PHP programmer and this cart is apparently written from wanna-be PHP programmers, the code is ugly, VERY inefficient. I choosed Quick.Cart and Magento. First one for small and simple online stores and second one for advanced needs. Hi, i am a opencart user and opencart is really good for me! I can set up my store using opencart within 10 minutes and it is quite user friendly as it does not require me to have much technical knowledge on it! Once you use it, you will love it! For me opencart have clean php code... easy to modify using my web store. Good script. Of course, things could always be a little better. I have been using OpenCart for over two years now and I never found it particularly hard to modify the system. If you have a little experience and understand the MVC- und vqmod-concept, it's actually pretty easy. Plugins are numerous and cheap. I definitely would recommend it! Opencart is a lot better than wannabe Wordrpress WooCommerce, which is designed to fail. Unfortunately, it is ridiculous to set install vqmod which is needed for the cart. Which means on to another option for me sadly. Opencart is the best shopping cart i have ever used. I used Magento which was very difficult and confusing. Zencart was ok but you need a lot of modifications on site and you must know some programming to figure things out. Overall Opencart is easy to install and it does not include so many files in the script compared to others. Wonderful experience and the staff are more than happy top help anytime. Useless tech support. They are just spinning in circles without solving a problem. Getting a refund for a bad non working plugin another useless. Its a lottery when buying their plugins on their website. Dont like this system.